Dr. Sierra specializes in facial rejuvenation and cosmetic eye plastic surgery to help patients overcome the effects of aging. Cosmetic eye and facial plastic surgery are unique specialties in requiring the surgeon's technical expertise as well as artistic skill and ability to naturally create a more youthful appearance within facial features and skin textures and tones, while preserving the integrity and function of the delicate eye structures. The first step in facial rejuvenation is to share your facial areas of concern and personal aesthetic goals with Dr. Sierra. After a thorough consultation, Dr. Sierra will review the scope of facial rejuvenation treatment options that can help you achieve your desired goals. 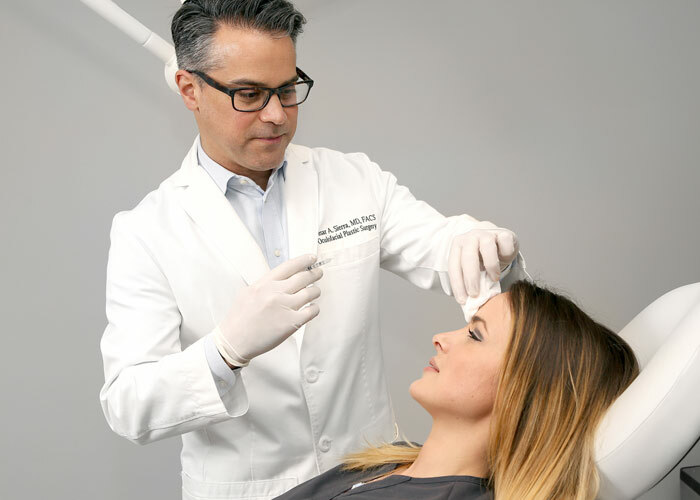 Dr. Sierra carefully blends techniques, procedures and treatments that provide you with results that are so natural that friends, family members and coworkers will simply say, “You Look Great!” without even knowing that you have had facial rejuvenation procedures. cosmetic blepharoplasty eyelid surgeryor “eye lifts” can be part of the facial rejuvenation plan to help minimize or eliminate puffy, baggy, dark tired looking eyes. For others, our approach might be to use BOTOX® Cosmetic layered with gel fillers to create a “liquid facelift.” A “liquid facelift” can help us smooth fine lines and wrinkles, help raise the eyebrows to look more awake and alert or even eliminate a saggy double chin with Kybella® so that you can avoid looking older than you feel. Sometimes we simply need to soften some of the forehead frown lines, furrows or wrinkles or volumize areas with gel fillers to achieve a “radiant” look. For many women we aim to eliminate crow’s feet around the eyes if they feel it is causing them to project an aging image. We work to create a natural “fresh” appearance by carefully selecting treatment options based on an in depth understanding of how the delicate tissue around the eyes, the eyelids, forehead and overall facial structures and anatomy can be approached to restore and maintain the youthful, energetic appearance you desire-naturally! To learn more about facial rejuvenation for women with a non-surgical “liquid facelifts,” cosmetic eyelid blepharoplasty surgery or brow lifts, schedule a consultation with Cosmetic Eyelid & Reconstructive Eye Plastic Surgeon Cesar Sierra, M.D. Cesar Sierra, M.D. is a Cosmetic Eyelid, Orbital & Reconstructive Eye Plastic Surgeon who specializes exclusively in the eyelids and facial areas around the eyes. Dr. Sierra is trained as both an eye surgeon and cosmetic & reconstructive ophthalmic plastic surgeon. His areas of expertise include blepharoplasty “eyelifts” or cosmetic eyelid surgery for baggy, puffy eyelids, brow and forehead surgery to lift troublesome areas.